At HeartCry, we believe that church planting is the primary task of missions. There are many gifts and callings in the body of Christ, but all of them must work together on the mission field toward the planting of biblical churches. It is one thing to do mass evangelism and to boast about the numbers of decisions made or the hands raised; it is quite another to establish a biblical church. Although Satan will oppose any ministry that purposes to advance Christ’s kingdom, his greatest disdain and most forceful attack is against those who would seek to establish a biblical church in the terrain which he has claimed for himself (I John 5:19). In Matthew 16:18, the Lord Jesus declared, “I will build My church; and the gates of Hades will not overpower it.” This text assures us that Christ is still at work in the world today, calling out a people for Himself – a people who have been redeemed by His blood and set apart for His glory and good pleasure. This redeemed body is most completely manifested to the world through local fellowships or churches that function according to the clear dictates of Scripture. For this reason, HeartCry is dedicated to working with and supporting pastors and missionaries across the globe who are laboring to establish biblical churches. It is our non-negotiable conviction that the greatest need of any nation, people group, culture, or religious context is the establishment and preservation of biblical local churches that shine as beacons of the Gospel through word and deed. Pastors and church planters of Kabwata Baptist Church in Lusaka, Zambia. The ordination of HeartCry partner/church planter Monametsi Bahudi in Zambia. A congregation pastored by HeartCry missionary Vijay S. in South India. HeartCry missionary Sundar R. baptizing a new convert in South India. HeartCry missionary Sarvajit G. teaching his church members in Nepal. 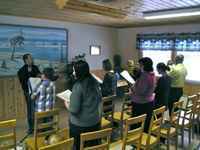 HeartCry partner Kyle McCartan planting a church in Ostrobotnia, Finland. 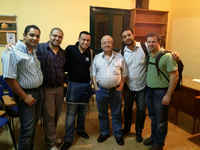 Leaders and members of a young church plant in Egypt. HeartCry partner and church planter Samuel D. preaching in Egypt. HeartCry partner Gennady M. (far right) helps this church plant in Alekseevsk. 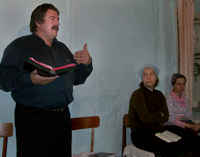 Sergey M. preaching at a new church near Irkutsk, Siberia. This young church in Angarsk, Siberia meets together in a member's apartment. HeartCry partner Maxim M. (center) encourages a church plant in Siberia. Wehrner Pancorbo evangelizing near his church plant in Cuzco, Peru. Wehrner Pancorbo sharing the Gospel in the plaza in Cuzco, Peru.